Millions of Americans miss the “good old days,” when receiving proper health care was a completely hopeless endeavor. 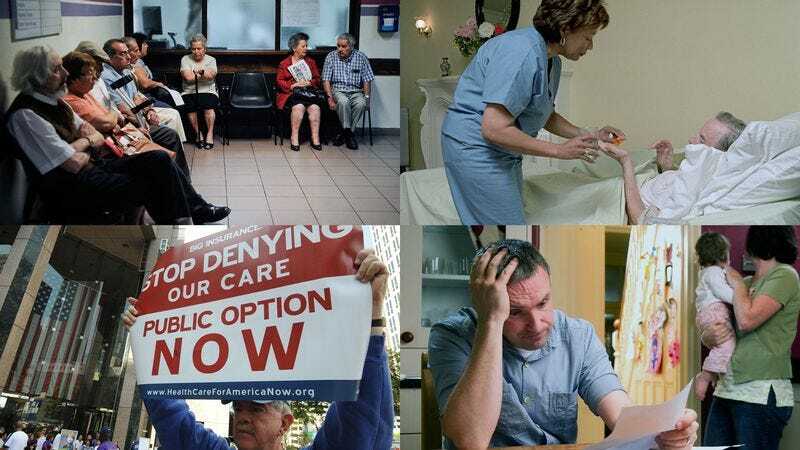 WASHINGTON—With the Affordable Care Act now making it possible for a greater number of Americans to purchase medical coverage, the nation looked back this week and fondly recalled a simpler time when its health care system was broken beyond any hope of repair. Describing a more innocent period in the country’s history—before opponents of the act temporarily shut down the government, and before the disastrous rollout of the new insurance exchanges led to widespread public exasperation—citizens shared with reporters their warm memories of what they called a bygone golden era. “Those were the good old days, ya know?” she added with a sigh. According to nostalgic sources, there was a time when Americans who lost their jobs and the benefits that came with them simply went without insurance, and that was that. During this halcyon age there was reportedly no way anyone who was out of work could afford health care, and if people had a serious preexisting condition, they knew for certain they would never again qualify for decent coverage. Harkening back to that less complicated past, citizens noted, for example, how parents who had no way to pay for their newborn baby’s much-needed surgery never even bothered getting their hopes up, but simply accepted that their child would never have a first birthday party. As they spoke with reporters, many Americans reminisced about the comfort they once took in the predictable dysfunction of this status quo. “Call me old-fashioned, but there was something reassuring in that,” he added. In a Gallup poll conducted this month, 72 percent of respondents agreed that even though the health care system had consistently screwed them over in the old days, at least they had known exactly where they stood. In addition, 65 percent said that while the most expensive illnesses were effectively a death sentence back then, there had been a certain peace of mind in knowing that if you ever got that sick, you would soon be gone and not have to worry about the hospital bills. Furthermore, 89 percent of Americans confirmed they had taken some small solace in the fact that if they needed money for a life-saving operation, they could always tape a photocopied image of themselves to a collection jar, place it in a local supermarket checkout line, and hope for the best.